Stretching to cover half of Israel’s landmass, but home to only eight per cent of its population, the Negev Desert is a beautiful but sparse part of the country. It appeals to the adventurous traveller and beach-lover in equal measure. At first appearing featureless, vast and inhospitable, the desert has for millennia been inhabited in the most ingenious of ways. Temperatures top out at 50°C in the summer, with zero precipitation, while the winter months see the occasional torrential flash floods destroy anything in its path. Against the odds, Roman, Bedouin and Jewish communities have each carved out their little slice of this beautiful desert to create thriving societies. I visited in November this year, a time when the days are short but the sun is still hot – a welcome break from the cold drizzle back home in the UK. Perched on top of an arid plateau, miles from any source of fresh water, is the stunning terraced palace of Masada. Built by King Herod and surviving some 2000 years, the Romans here coaxed the waters from the torrential floods in to reservoirs using the gradient of the plateau. 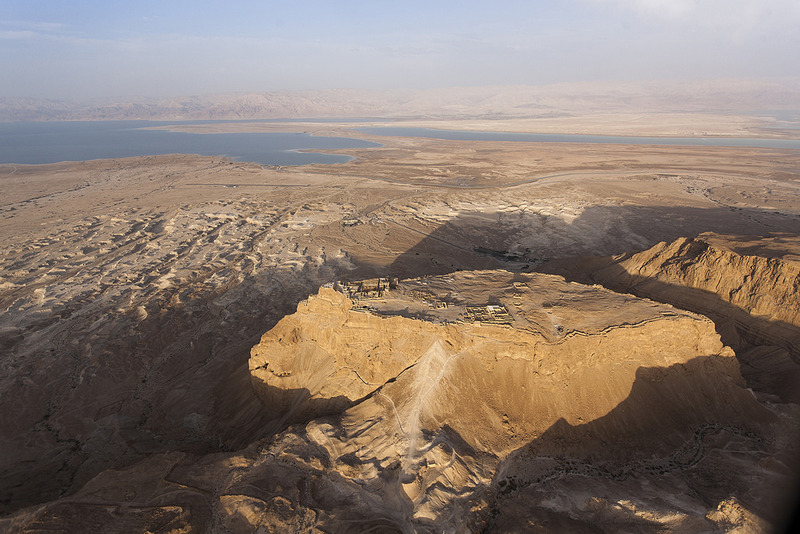 This provided water for the people of Masada year-round, allowing them to live in this almost impenetrable stronghold. One of Israel’s most popular tourist attractions, it is a shrine to Roman architecture and a testament to their engineering ability. A walk up Snake Path, wander round the ruins and gaze over the vista is an awe-inspiring treat for any visitor. Today, kibbutz are dotted throughout the desert, taking their water from the natural reserves just below ground. 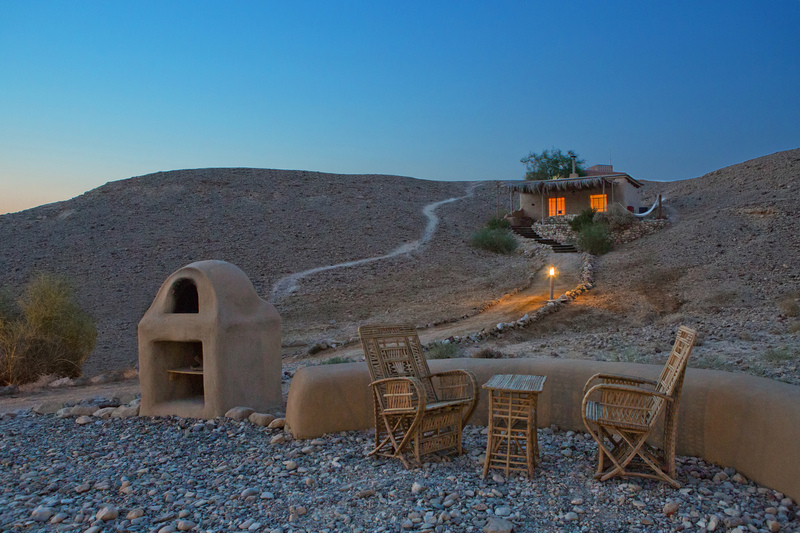 Many offer accommodation for tourists, with quality ranging from luxurious to the very basic. Popularised in the 1970s by idealistic youths from all over the world, searching an antidote capitalist living, a few survive and those that do are thriving. “We are socialist within the compound,” explains Yuval Benhai, manager of Kibutz Ketura where I spent the night. “But in our business dealings with the wider world we work within the capitalist system,” he adds, somewhat confusingly. Kibutz Ketura grows dates and anti-oxidant algae, as well as running a solar farm, to sustain their quixotic way of life. Most kibbutz offer tours to curious travellers and are heavily focused on environmental sustainability. Kibutz Ketura sits like a green oasis in the arid valley, it even has a swimming pool. Guests are welcomed into the communal dining hall, reminiscent of a school canteen (but with better food). During our time we ate salads, both fresh and pickled, sea bream and rice, as the clatter of daily life on the kibbutz carried on around us. Eerily still and boat-less, the mineral rich, oily waters of the Dead Sea contain no life except the occasional person bobbing on the surface. Due to repeated diversions of the Jordan River the sea is receding, leaving salt scarred banks of sinkholes to litter some northerly parts of the coast. Ein Bokek has, however, been artificially maintained to provide a safe area for floating tourists. It is a rather sanitised but safe feeling little resort town with high-rise hotels and a well-kept beach framed by the jagged bluffs of the Judean Desert. The lowest place on earth, Ein Bokek is a centre for the medicinal and cosmetic markets and has plenty of spas to choose from. 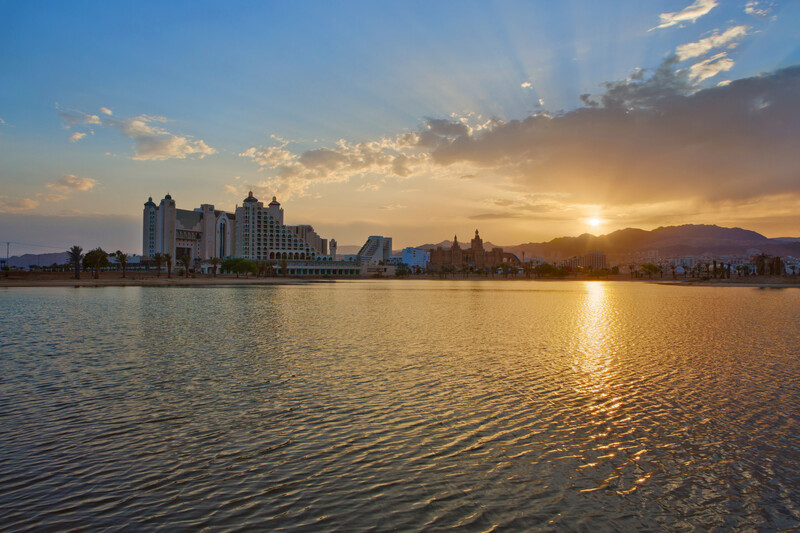 For a more traditional seaside experience, travel south to Eilat, a seaside town centred on a massive tax-free mall. Jet skiing, windsurfing, beach lounging and drinking are common undertakings here – much as they are in resorts around the world. Huge hotel complexes line the shore and the water is tepid, crystal clear and clean. During our brief visit, the Dolphin Reef restaurant and lounge offered a gorgeous, vine swept Neverland-esq tree house fit for pixie royalty. The relaxation pools here are open late, and feature underwater music, while there is also a meandering botanical garden which is well worth a visit. At the same time the Underwater Marine Park Eilat, with its sunken viewing area 100 metres from shore, offers spectators a dry way of seeing the local coral reef and all its accompanying marine life. It certainly is not natural, however, and some of the tank sizes could do with an upgrade, but the park makes some conservation efforts and it is an easy way to observe the wonders of the coral reef. 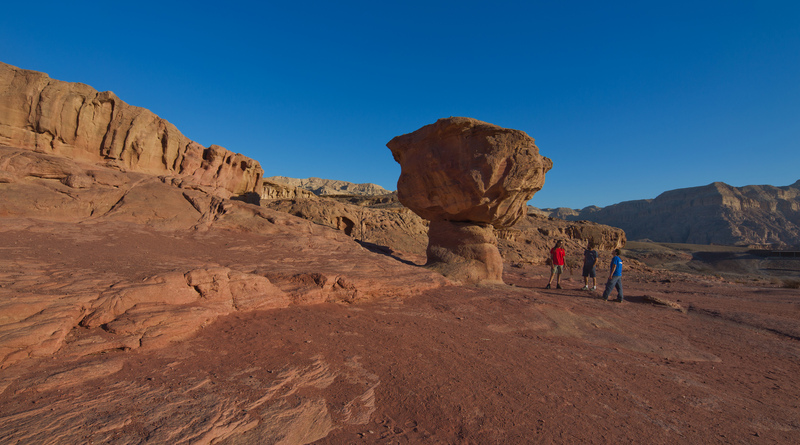 Back in the desert, towering stone sculptures have been carved from the cliff edge by wind and sand at the site of the world’s oldest copper mine, Timna Park. Ample hiking trails here take you through Roman copper mines dating back as far as 5000BC. An artificial lake, restaurant and camping sites are all available in this well managed location. I joined over 1,000 yogis simultaneously practicing a sun salutation as dusk fell at the foot of the awe-inspiring Solomon’s Pillars. 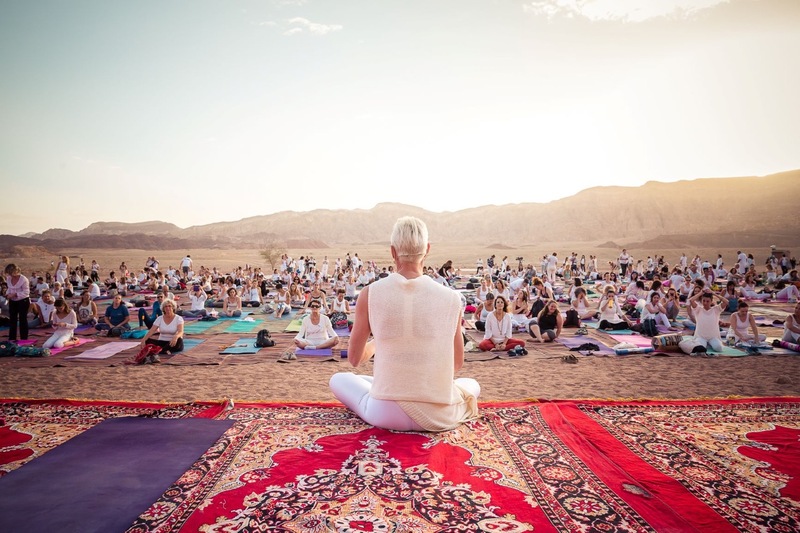 It was the climax of Yoga Arava - an annual, weekend long festival, spanning some 200 kilometres of the Arava region, just one of the many events hosted at Timna Park. Any trip to Israel raises concerns about safety. However, despite the best efforts of Banksy at World Travel Market this year, the conflict with Palestine was rarely mentioned during my visit. Security is reassuringly, if a little intimidatingly, tight. Getting in and out of the country entails a thorough interview, while my hand luggage was searched and x-rayed on the way through Luton in the UK. All visitors are advised to arrive three hours before flights – and for once this is not an excuse to leave you at the mercy of overpriced boutiques on the concourse. Looking ahead, Assaf Ramon International Airport is expected to open soon. This will replace the existing Eilat and Ovda airports, leaving prime real-estate for further hotel developments in the beach destination. With new low-cost flights from Europe also planned, the development could further accelerate this underappreciated destination. There is plenty to see away from the beaches, with the architectural wonders offering a welcome counterpoint to the glittering hotels. To find out more about visiting Israel head over to the official website.